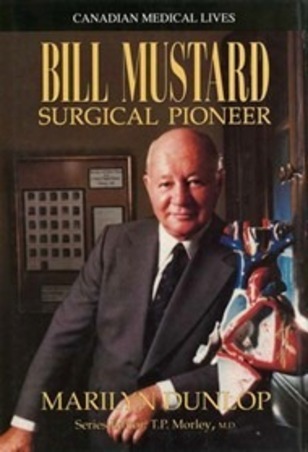 When WIlliam ("Bill") Mustard graduated from the University of Toronto medical faculty in 1937 at the age of 22, he was the youngest doctor in Canada. During the next four decades he distinguished himself, first as part of the Canadian Army Medical Corps in the Second World War, then at Toronto's Hospital For Sick Children, as a surgical pioneer. Mustard remains perhaps the sole surgeon in history to have had two major operations in different fields named after him, both of which he invented. The first, the Mustard Procedure, was a muscle transfer for polio victims to restore the ability to walk. The second, the Mustard Operation, involved the reconnection of the heart's blood vessels of children whose great blood vessels are transposed; the operation has since saved the lives of thousands worldwide. Marilyn Dunlop, Medical Reporter for the Toronto Star, has written a biography of the doctor whose combination of humour, daring, compassion, and intelligence made him one of this century's most outstanding and honoured surgeons.